Is there a free trial version of the RideMax software available? Will RideMax work on my Mac? iPhone? Android? Doesn't it ruin the fun of being in the park if you have to follow a plan? Why not just relax and enjoy the park? Why Should I Care About Using a RideMax Itinerary? Where Can I Get RideMax? We certainly don't expect anyone to pay for the RideMax software if they weren't satisfied with the results. Rather than offer a free trial, we've decided to offer a 30-day money-back guarantee instead. It's hard for us to imagine how we could offer a free trial and still make it work economically. If you use the software and find it wasn't worth the cost, simply let us know within 30 days from the date of purchase why you weren't satisfied, and we'll refund your full subscription cost and remove you from our subscriber list. We really do want to make RideMax as risk-free as possible for our customers, and feel that this guarantee achieves this. Will RideMax work on my iPhone, Android, or Mac system? Yes! RideMax now supports a web-based interface which allows you to create plans on your Mac, Windows, iPhone, and Android systems. We've actually found that following a RideMax plan makes the Disney theme park experience less stressful, not more, especially when the park is busy and our goal is to ride a reasonable number of attractions during our visit. (Of course, if you're just visiting the park to "people-watch," this doesn't apply to you!) With a RideMax plan, we find we don't waste nearly as much time standing around with our group deciding which attraction to ride next, or trying to "outsmart" the FASTPASS system to make the most of our day. We simply make our RideMax plan in advance, arrive at the park early, and go from ride to ride with very little waiting overall --even on days when the park is crowded. It amazes us how people can spend thousands of dollars for a trip to Disneyland or Walt Disney World, only to show up at the main gate with no idea of how they should actually "do" the parks. Rather than moving quickly from one attraction to another, they spend needless time wandering around with their heads buried in the park map, trying to figure out where to go next. They have no feel for typical wait patterns at the various attractions, and end up spending unnecessary hours standing in line. By using RideMax and putting a few minutes of planning in before your visit, you can cut down substantially on this wasted time, and spend more time doing what you paid all that money to come to the parks for in the first place! You may purchase a subscription to the RideMax software from our distributor by following this link. If paying with Visa or Mastercard, once your credit card has been authorized, you will receive an email message -- usually within just a few minutes -- with download instructions and a private registration number you will need in order to run the software. Note that unlike credit card orders, PayPal orders often require manual processing. If you are in a hurry to receive your order we recommend using Visa or Mastercard as payment, since these orders are processed automatically and aren't subject to the manual processing delay. Please note that RideMax requires Windows, with a screen resolution of at least 600x800. An internet connection and Internet Explorer 4.0 or greater are also required. 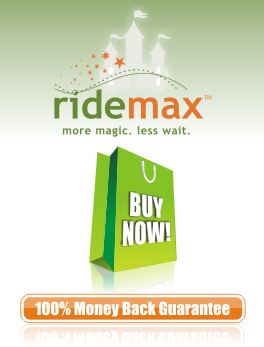 Our guarantee is simple: Purchase your RideMax subscription, download the software, and use it to create optimized itineraries for the dates of your visit, for the attractions you want to ride. If, after using these touring plans you don't feel like they were worth the price of your subscription, simply contact us by email within 30 days of your purchase and explain the reason for your dissatisfaction. We'll then refund the full price of your subscription. With this guarantee you have nothing to lose but a lot of time standing in line, so why not purchase your RideMax subscription and start planning your Disney visit today?!! The first time we tested a RideMax schedule on a busy day at the park, we knew we had discovered something important! Some of our recent customer reports confirm this too. On one "test" occasion, during Spring Break at Disneyland, we arrived at the park on a very busy day and followed our RideMax plan. The results were simply amazing -- much better than our experience with "canned" guidebook touring plans. It was as if we were in a different world from the rest of the park. We could see the crowds, but hardly ever felt them, due to RideMax's efficient use of our time in the early morning, optimum use of FASTPASS later in the morning and afternoon, and waiting until later in the evening to schedule us for rides that had been busy earlier in the day. There are also online reports of customers successfully using RideMax, including this RideMax for Disneyland discussion on Yahoo! which includes feedback from one poster who reports that he used to sell Disneyland tickets, and had interaction with dozens of RideMax customers as a result.